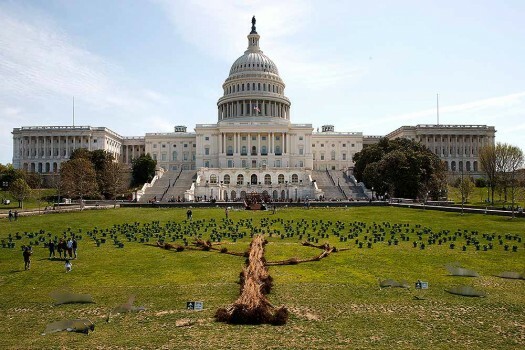 Activists of the World Wide Fund For Nature (WWF) set up led-lights in front of the illuminated Brandenburg Gate to mark Earth Hour, in Berlin. 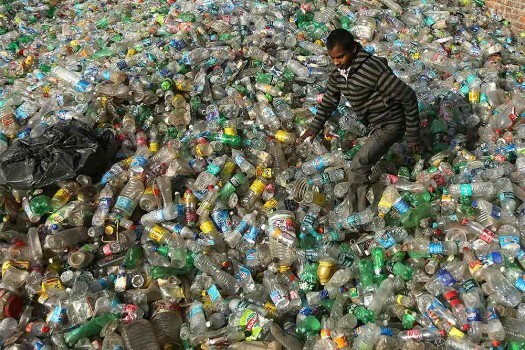 A worker walks on plastic bottles as he sorts them before sending them to be recycled at an industrial area on the outskirts of Jammu. 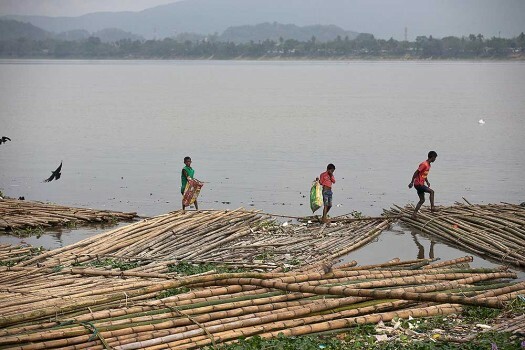 Children collect plastic bottles to recycle from a polluted River Brahmaputra in Guwahati. 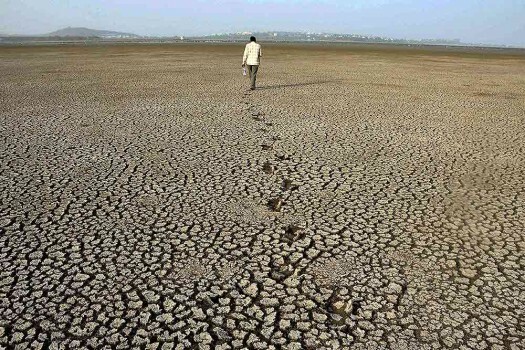 April 22 is observed as Earth Day every year as a tool to raise ecological awareness. 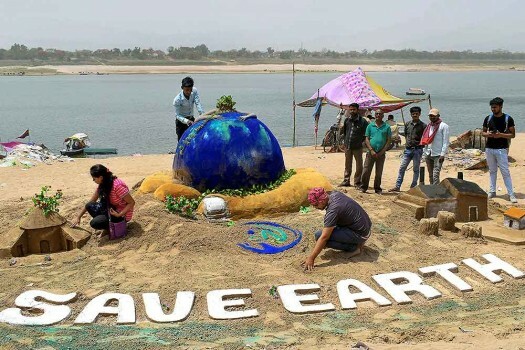 Students of Allahabad Central University make a sand sculpture which reads 'Save Earth' on the occasion of 'World Earth Day' on banks of river Ganges at Sangam, in Allahabad. 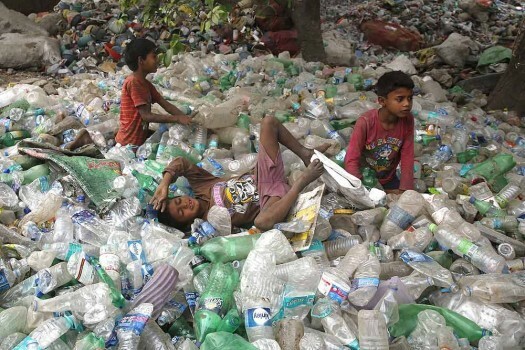 Children rest on plastic bottles while playing during Earth Day in Allahabad. 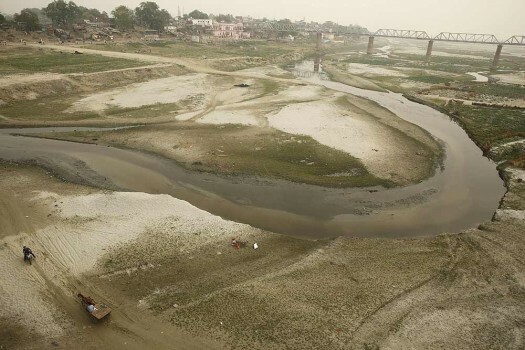 The dried Ganga river basin at Sangam, winds through the confluence of the Ganges, Yamuna, and the mythical Saraswati River on the world Earth Day in Allahabad. 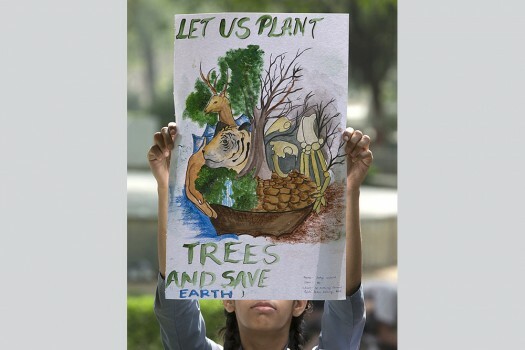 A school girl displays her artwork promoting the conservation of the planet during the world Earth Day at Chandra Shekhar Azad Park, in Allahabad. 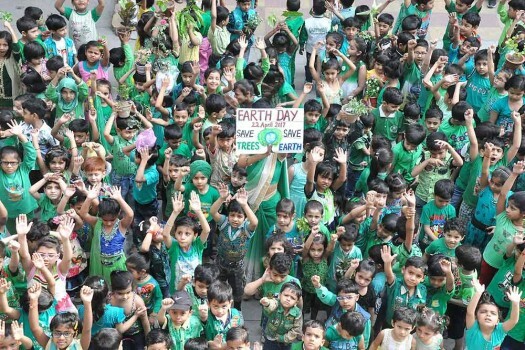 Students of a school in Moradabad observing 'World Earth Day'. Students of A N College, carry earthen pots, during the 'save birds campaign' on the occasion of World Earth Day, in Patna. 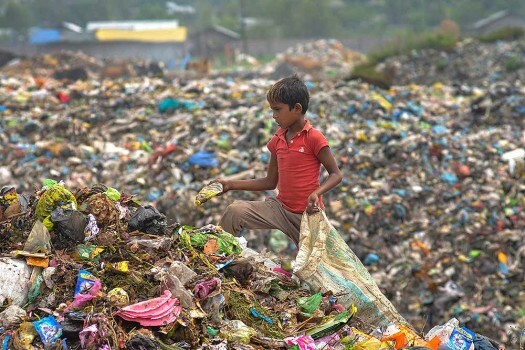 School children take an oath to keep the planet clean after participating in a rally on the world Earth Day at the Chandra Shekhar Azad Park, in Allahabad. 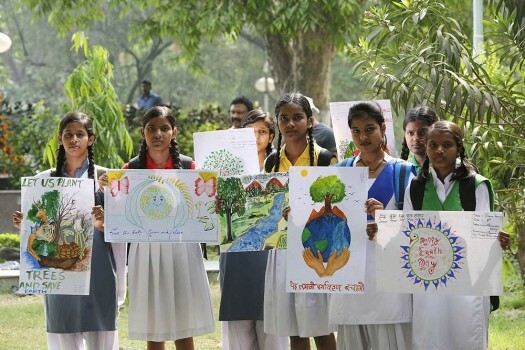 School children display their drawings promoting the conservation of the planet on the world Earth Day at Chandra Shekhar Azad Park, in Allahabad. 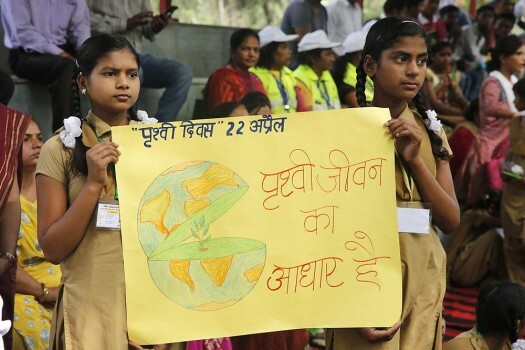 School children participate in a rally depicting slogans of conservation of the planet on the world Earth Day at Chandra Shekhar Azad Park, in Allahabad. 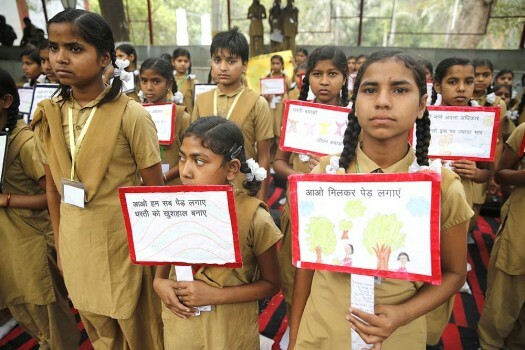 School children hold posters with slogans promoting the conservation of the planet on the world Earth Day at the Chandra Shekhar Azad Park, in Allahabad. 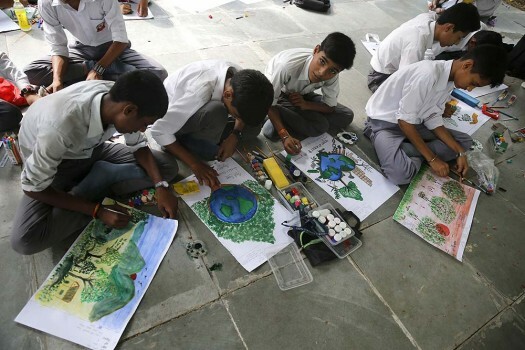 School boys draw pictures promoiting the conservation of the planet on the world Earth Day at the Chandra Shekhar Azad Park, in Allahabad. A school child draws a tree promoting conservation of the planet during world Earth Day at the Chandra Shekhar Azad Park, in Allahabad. Two women sweeping a roadside on the eve of 'World Earth Day', in Bikaner. Cigarette butts — whose filters contain tiny plastic fibres — are the most common type of plastic waste found in the environment.